I’m unable to download the Facebook cover photo template. Can you please email it through? Right click the image and choose to save to your computer. The template is right in the post. Thanks Louise, I spent ages perfecting our cover photo, uploaded and looked perfect on my laptop. Took me a day to realise it had cut off the sides on mobile!! But a fairly simple fix with your info. Great! Glad to hear it, Mike. I don’t think your template is correct. I attempted to use it and I had far less vertical space than the template specified. Also noticed on your page that your own cover photo has been sliced vertically. It is also extremely distorted. I am viewing on a 2017 Lenovo ThinkPad. I’m now seeing a bar across the top of the cover photo on desktop. But sometimes these changes release in limited areas, and then they revert back. Interesting about the distortion. I don’t see it. I, too, was unable to use the “official” height of 312. To get all my image displayed, I had to use 250 px. As with other users, my image displays perfectly on desktop and almost completely in Safari on mobile devices. However, the Facebook app on iPhone and iPad chops the image horribly. I’m now going to try Louise’s extra high approach and see how that works. 250? How weird (and tiny). I hope this works for you! My cover photo still looks fine. Hi, Louise – Using Firefox’s inspector shows that the desktop version of the Facebook cover photo is now a just a tiny amount of pixels fewer – 820 x 312. Proportionately, it probably doesn’t make too much difference with your template! That’s not from FB but from a Fan Page. It’s not contradictory but a different way to deal with the size difference that’s more desktop-focused. And also low-resolution. thanks a lot. it’s help me to format the workspace when I working in something for social media.? This is so helpful, Louise! I really appreciate you taking the time to put this together and delivering the information so clearly. A big help for designers like me! Much love to you! I’m not good with this stuff! So please be patient! I’ve saved your template to my drive but what do I do now please? 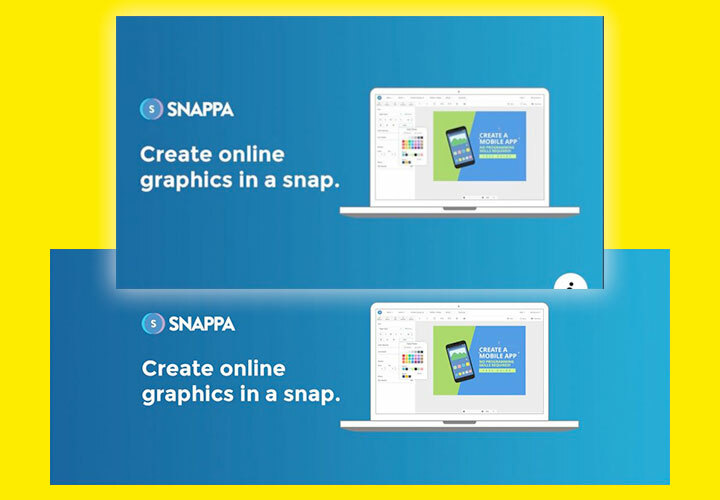 Create your canvas in your favorite image editor at the full size: 828 x 465 pixels. If you’re using Photoshop or another program that gives you the ability to add layers, add the template as a semi-transparent layer so you can see what will get cut off on desktop. Otherwise, you can just use it as a reference to visualize what will get cut off on desktop. Thank you for this! This solved my problem and my cover photo is now mobile friendly! Thanks SO MUCH for this guide! Finally, I’m able to have a decent looking Facebook cover for desktop and mobile applications. Yay! Glad it helped, Betty. All Hail the Queen! You ROCK! THANK YOU! Thank you very much for taking the time to share this information. I tried to figure out a way solve this problem and your solution is just great. Can I use Mobile cover size 828*465 as you told? And will it appear on desktop computer? Please answer, because I’m using FB just on Smart phone ? It will appear cropped on desktop. You (or have another admin) should go in and adjust the cropping on desktop to your liking, bc I can’t guarantee FB default cropping. Your trick made our event page look great. Thanks so much for this info! Worked like a charm. I have used your tips on several occasions, thank you so much! Unfortunately this doesn’t work for me. I’m trying to upload from desktop and I can’t click the ‘Save’ button because it displays at the bottom corner of the image which isn’t visible because the image is too tall for the frame… Anybody else have this issue? I haven’t heard of this. I’ll try it next week. Which browser are you using? Chrome and Firefox. I ended being able to do it by adding the cover photo while sitting on the ‘photos’ tab of my page because of the way the page is displayed – there was just a sliver of the save button showing that I could click. It’s pretty odd that Facebook hasn’t created an easier way to do this. The template works really well though, thanks! Yes, very strange! Thanks for letting us know. FB really crunches the cover photos. It’s even worse if you upload from mobile. Awesomely helpful, particularly the download template – thank you! Just wanted to say that this post and the social media cheat sheet really helped me out with designing some stuff for my local food bank. You rock, Louise! I dont understand one thing. How to upload desktop and mobile cover separately? Because If I will use mobile version than it will look bad on desktop and vice versa. You can only have one cover. That’s why the template – so you can design it so the part that shows on desktop won’t cut off any important info. The template is to show you how much of the mobile image will show on desktop, so you don’t put any important elements in the areas that will get cut off. Thank you for the great templates. I have been having lots of fun with Facebook in the last few days. Not only are the page sizes doing a lot of changing they are also experimenting with webP compression. 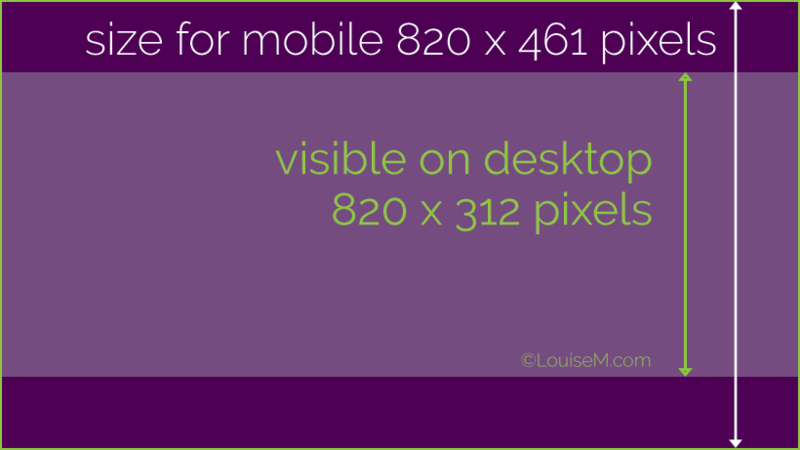 According to Facebook you need to increase your page resolution from 72ppi to 251ppi and keep your page size to 851px X 351px. This size looks great on the desktop page, terrible on the ipad – it cuts off the sides, terrible on the iphone it cuts off the sides. I will try your templates hopefully they are newer than the info I found. 251ppi? Who said that? PPI doesn’t matter when you’re designing web graphics. They’ll be displayed at the resolution of the device they’re viewed on. The cover photos haven’t been 851 wide for a year. Try my size and let me know how it goes! It worked great for me. Sorry I can’t find the article I read on webP which suggested I work on my image at 250ppi and upload as a .png. I also asked a photographer friend about it and she uploads all her Facebook images as 300ppi jpgs. I had to make my own template 250ppi, 851px X 315px which they do say is the correct page size on this page https://www.facebook.com/help/1703757313215897/?helpref=hc_fnav. Through testing I found there was an area of 140px on the left and right sides of my cover image that was getting cropped off when I viewed the image inside the Facebook app, on an iPhone . Strangely enough viewing the same page inside Facebook.com in Chrome there is no problem. I just did the same test on my iPad with the same page and image. Viewing it inside the Facebook app, it gets cropped. Viewing it via Facebook.com, it doesn’t get cropped. I said ppi doesn’t matter because Facebook seems to be allowing the upload of all all resolutions as long as the file sise is under 100kb and lets webP work it’s compression magic and shows them all as 72 ppi. At least that’s my guess because all the 250ppi and 300ppi photos that I have uploaded to Facebook and downloaded to my system have opened up in Photoshop as 72ppi images. So I am left with 2 questions. 1. What do we do tell our client’s not to use the Facebook app and just build for the web? 2. If Facebook is going to compress our images with webP why not save them with a really high ppi at the correct final size ? By the way for anyone that needs this you can create a folder on Facebook and turn on HD and it won’t compress the images you save into it. I haven’t tried it yet. PPI is totally irrelevant for web images. We have absolutely no control over the PPI of a user’s device. Whoever told you to produce a certain PPI is misinformed. You asked: What do we do tell our clients not to use the Facebook app and just build for the web? People are going to use the FB app, whether your clients do or not. Read the article and use the template. It’s optimized for both. Great! that would have taken me aaages to figure out! Thanks! This was so helpful and amazing. Thank you. You don’t happen to have just as perfect of a solution for twitter do you? Just found your site – wanted to update FB cover photo. Thank you, this just saved me a whole world of pain. Having been a graphic designer for 20 years and finally managing to quit and do something entirely different (something that makes my heart sing!) I really appreciate the time and energy you have put into this, something so simple to most but some of us know how much time you’ve spent. Thank you. You’re welcome! And good for you! Enjoy. When creating a graphic for Facebook, was resolution/dpi do you use, and set the color to RGB when creating a new document, correct? I use 72, but it really doesn’t matter, as graphics on the web will be shown at the viewer’s screen resolution (usually 72). This is why dimensions are provided in pixels and not inches or cm. Thank you so much! I’ve been looking for something like this for ages. Does this apply to facebook group cover photos as well? It seems every cover photo on FB is different. See if this post helps with the groups. I’m not sure if that’s still current – FB changes so often! I updated my cover photo abd changed it to video. However it chopped most of it as u may be able to see on mobile view. Any ideas how to handle this? Probably the same issues as a static cover photo. So you’d need to create your video so that it works in both shapes (desktop and mobile). I’ll have to try it. Thanks for the template. Any idea how to get the images to save? I’m trying to update my group cover photo. I’ve tried uploading directly, but it won’t save. So I uploaded it to group photos, it still won’t save. have tried 3 different browsers – chrome, firefox and safari. Any other ideas? Oh my! Sorry, I haven’t heard of this issue. I’ve tried every possible sizing you recommended up above (the 828 x 315, the 830 x 315, the 1200 x 675, the 820 x 461)… And it still cuts it off on the side of my Facebook cover on mobile and tablets… Do you have any recommendations? It’s driving me dotty!! For a Facebook business page, 1200 x 675 or 820 x 461 works for me. It’s also the same proportion FB recommends for mobile. Not sure why you’re having problems, sorry. Nice (not). I guess they took my info and wrote their own post. Did you read my article? You’re making things way too complicated. Would love to hear if you work that out. Your writing style inspires me. It’s so clean and personal. I can hear you talking. You are a great teacher!! Kudos!! This is great! I was struggling for so long trying to find the perfect responsive template. You rock! 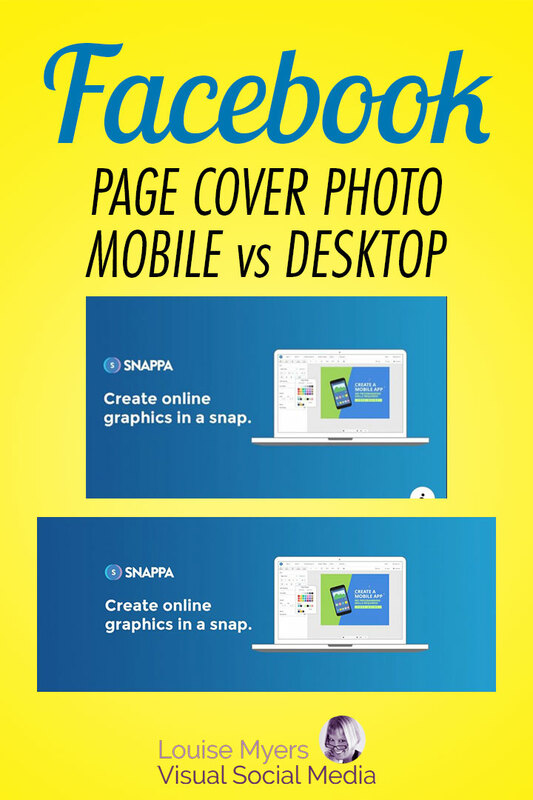 How we can get more traffic through facebook and how to choose facebook cover banner design ? I Have run a ads on facebook but the charges experience rather than other Campinas.. how we can reduce the cost…. I would suggest Google for free info, and maybe purchase a course. Certainly more than I can answer in a comment. Thanks for the post. Works brilliantly! This was extremely helpful. I’ve been trying to fix our mobile cover for a month or so now and I’m glad I found this page. regarding the png, do you prefer to have it in 300 ppi or 200 or? would really appreciate hearing your take on that. It makes no difference, as the web ignores ppi. I make all web graphics at 72 – but the only factor that matters is the overall pixel size. I appreciate the follow-up Louise. Thank you for much – worked wonders for the FB page cover photo, however could not get the template to work as well for the FB group cover photo. 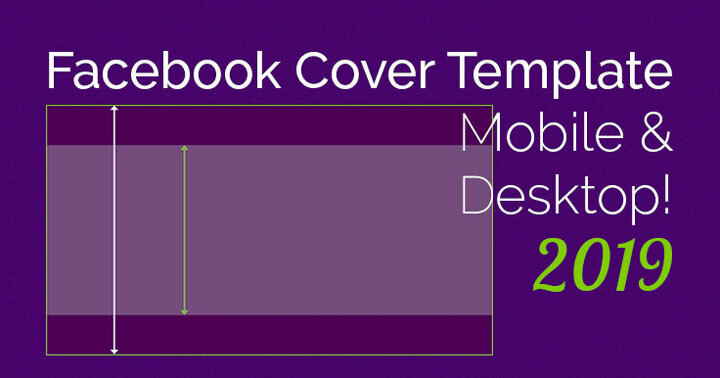 Do you have a similar template as the FB page cover template for FB group covers? Hi Anna, updated info and my new FB group cover template here. Wow, this worked like magic, thank you very much! What programs do you recommend to create banners, cover photos, or just general content? I’ve messed around with a few apps, but haven’t found one that I am in love with yet. Any tips for Facebook Group’s cover photos? Nevermind. I saw your previous comments. Hopefully those guides you linked work! Hi Austin, updated info and my new FB group cover template here. This is extremely helpful, but I just have one problem. My profile pic is still over the top of my cover photo! It seems FB may not have changed how everyone’s pages display? In any case, I’m still having to block out the 170×170 px area so that I don’t have important content there. Just thought I’d share. Still appreciate your helpful hints and the template!! On a FB business page? I may not have been clear about that 😉 It would be very odd if after a year this wasn’t applied to all pages. Of course, anything’s possible with FB!